I teach the way that I like to experience a workshop: create a stimulating environment for learning and experimenting, balanced with plenty of time for group and individual discussion. Contact me for details, questions, and to sign up. Thank you for your interest and continued support. Private sessions are designed to offer a stimulating learning environment that focuses on your interests and skill level. Each session includes a mix of demonstration, experimentation and discussion. One-day or multi-day sessions available, to fit with your schedule. Sessions held in my working studio. Semi-private option: If you’d like to learn along with a fellow artist, contact me and we can discuss the option of semi-private instruction. After you register, I'll send a materials list; many tools and supplies are provided. Contact me for more details, questions, or to sign up. I had read all I could find on oil and cold wax techniques and have done several oil and cold wax experimental paintings. It wasn’t until I recently worked with Mark that I finally have been able to achieve the effects I so admire in many oil and cold wax paintings—the rich layers of color and interesting textures. His teaching style and generosity with his knowledge helped me take my art to a new level. I couldn’t more highly recommend Mark’s workshops. - D. U. Work with Cold Wax Medium and learn how to incorporate this and other mediums into their current oil painting practice. Experiment with numerous methods to add texture, unique mark-making and layering to your paintings. Discussions on the process of composition, planning and editing to build a painting. Incorporate abstraction into your landscape painting process. Hands-on guided exercises, using traditional and non-traditional application and mark-making tools. Individual and group critique sessions. All workshops are small groups, to ensure individual attention and interaction. Additional 2019 workshop dates coming soon. 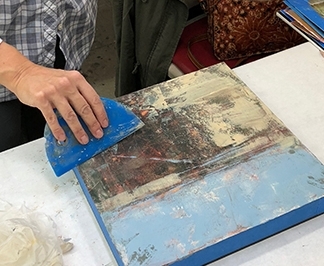 I was so happy I took this workshop with Mark, and I recommend it to anyone interested in finding out how to add cold wax medium to their art practice. His way of teaching is very clear and understandable. He is extremely engaging, knowledgeable and approachable with any questions you have too. Many thanks! - A. M.
The workshop with Mark was truly transformational! I learned a variety of techniques and methods that have given me confidence to continue working with Cold Wax Medium. The combination of demos and hands-on exercises gave me an understanding of how to use the medium and apply it to my current painting practice. Mark was extremely positive and encouraging and provided constructive feedback to my work. Thank you Mark! - K. H.
The Mentor Program offers personalized and private discussions with a focus on your interests, goals, development and work. 1:1 meetings in-person, by phone, or FaceTime.